Parliament, Tuesday 3 April 2018 - The Commonwealth Women Parliamentarians (CWP) Africa Region Steering Committee extends condolences to the Madikizela and Mandela families during this difficult time as they mourn the loss of their loved one - Member of Parliament Honourable Nomzamo Winnie Madikizela-Mandela. Honourable Madikizela-Mandela was amongst women legislators who, through their roles as freedom fighters and later as public representatives, dedicated her life to work tirelessly to better the lives of her people in her own country and globally. She always sought to bring to the fore the lives of the poor, in particular those in the informal settlement and rural areas. Honourable Madikizela-Mandela ensured that the voices of women are heard in the corridors of Parliament and legislatures. Her uncompromising commitment to women's emancipation, as part of the struggle for liberation, inspired women in her country and the world. 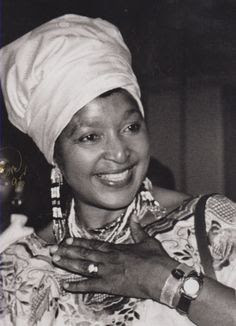 Her activist life during South Africa's bitter struggle against apartheid gave hope to many to continue to fight for freedom. She was a thorn in the side of the evil system of apartheid, against which she stood with fearlessness and unparalleled bravery. As the CWP Africa Region, we pay tribute to this remarkable woman parliamentarian, who was part of the first generation of women Parliamentarians in post-apartheid South Africa.